...that Araqiel was an AI that took the form of the terrifying devil from which he was named? ...that the alien words spoken by Grunts and Elites in Halo 4 are Sangheili? 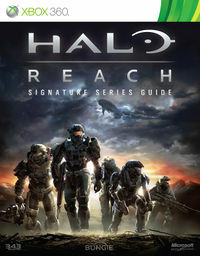 Halo: Reach Official Strategy Guide is the official strategy guide for the video game Halo: Reach, published by BradyGames. It was released on September 14, 2010. The guide contains a detailed map of each mission and multiplayer map, including locations of default weapons. The guide includes a list of all the Achievements and how to unlock each one, a complete bestiary with notes on UNSC and Covenant armament, and an equipment list. It is also available as the hardcover "Legendary Edition Guide". This limited version has one of six special covers beneath the dustjacket, each showing a member of Noble Team. It also doubles as a Halo: Reach art book, with 80 pages of Reach artwork. On pages 174 and 175, the CCS-class Battlecruiser Noble Six must disable with the Onager in The Pillar of Autumn is mistakenly labeled as a Covenant corvette. In the section detailing the ending of the level The Pillar of Autumn, the guide instruct players to wait for Colonel Holland's order to fire on the CCS-class battlecruiser, instead of Captain Keyes. Most of the Armory items are either missing or had their price wrongly labeled. The amount of credits needed to attain a Rank is mostly wrong. There are many more ranks then shown at the end. The list of enemy point values on page 384 has an entry called the "Daily Challenge Elite". This might be the BOB, considering that the point value is the same.